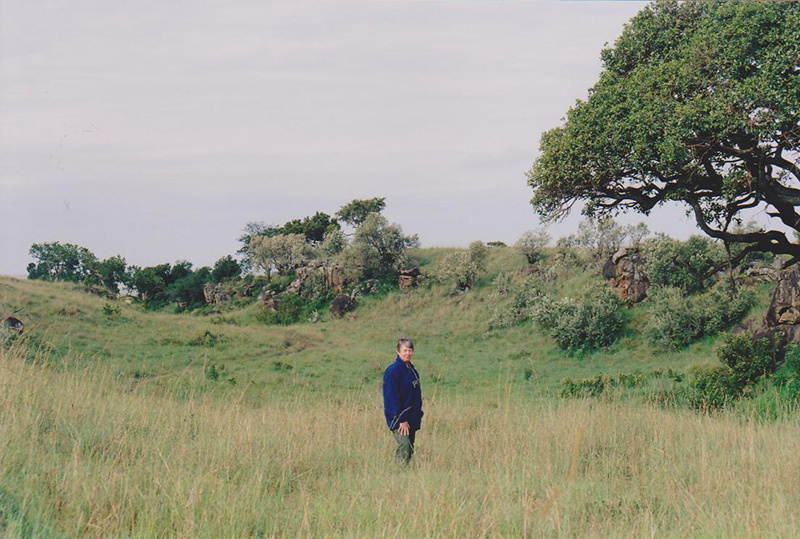 "The Masai Mara is special at any time of the year but during the wildebeest migration is becomes spectacular." "A balloon safari drifted overhead and the sound of it's burners being fired sent the lionesses running into the tall, thick elephant grass which surrounded us. The ever increasing number of zebra and wildebeest gathering across the plains would ensure a plentiful supply of food for them and others. 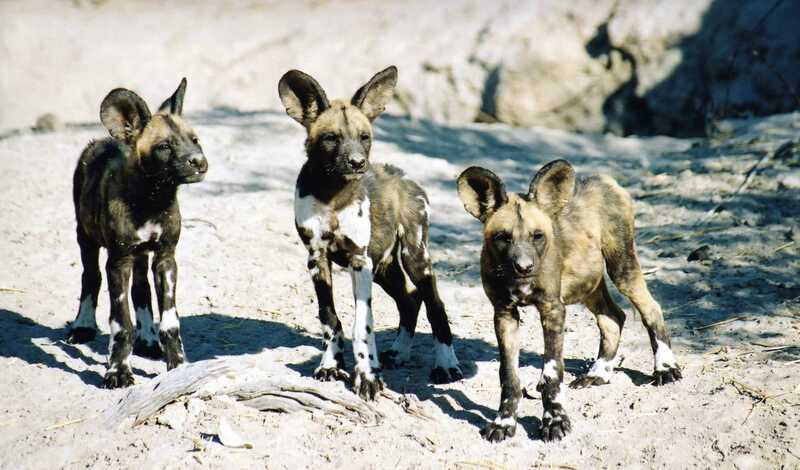 Among the large herds of zebra which congregated near the river were topi and impala, up to their bellies in grass the colour of ripening corn. On the horizon vast herds of wildebeest could be seen slowly edging their way towards the Mara river. Once they reach the river in their thousands and have nowhere to go but forward, then the real drama of the migration begins." MY BIG CAT MOMENT - reproduced in Wildscape & The Wildlife Art Society of Australasia magazine. She stood within inches of my hand. It would take only the slightest movement for me to stroke her tawny coloured back, yet caution and a sense of self-preservation made me sit quietly, hardly daring to breathe lest something should break the spell.............she stared out towards the plains searching for some movement, then she turned her head and our eyes met. For one brief moment I looked into the very soul of a wild lioness. I felt no fear only a mixture of excitement tinged with a slight apprehension -What if? - but there was no cause or concern. This was one of the Marsh Pride from the Masai Mara in Kenya made famous in Big Cat Diary with Jonathan Scott and Simon King. I was attending the 1st Annual Wildlife Festival, staying at Governors Camp on the banks of the Mara River. 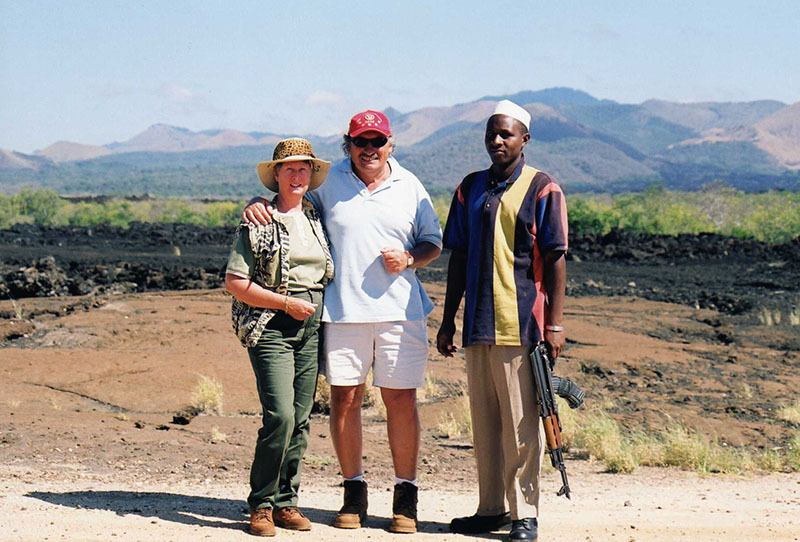 This was our third day spent enjoying numerous game drives, workshops and talks by a variety of wildlife specialists including the Scotts and David Shepherd. I had even sat painting at Leopard Gorge, sadly no leopards but this moment however, was very special and one to be savoured. 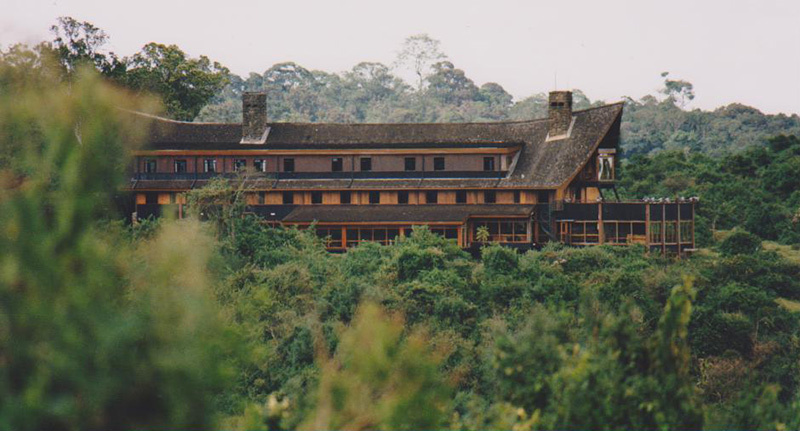 "TELL THEM I'LL BE IN TSAVO" - Words made famous by Denys Finch Hattons, whose love affair with Karen Blixen came to our screens in the film 'Out of Africa'. The Chyulu Hills in West Tsavo are the setting for a spectacular lava flow which occurred some 2-300 years ago, called the Shetani Lava Flow. Local legend has it that you can still hear the moaning of the people who died in the eruption but this is of course just the wind as it whistles through the porous lava rock caves. If your lucky you might even spot Klipspringers as they nimbly jump about the uneven, rocky ground, which is of course perfect for them...............On a clear day you might even see Mt. 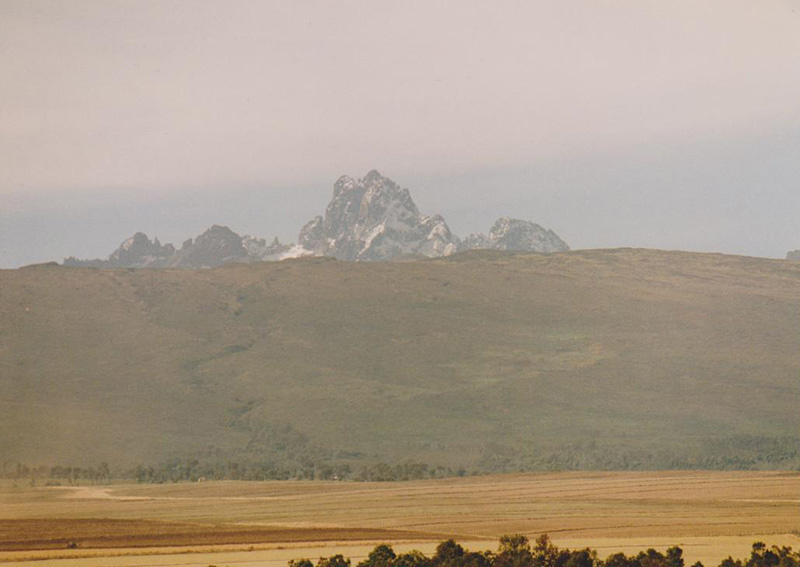 Kilimanjaro with it's snow covered peak in the far distance. 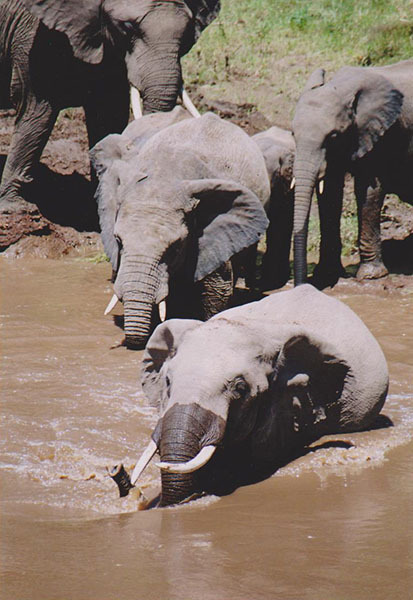 WASHED OUT IN AMBOSELI - Originally written & published as an article in Msafiri, Kenya Airways Inflight magazine. 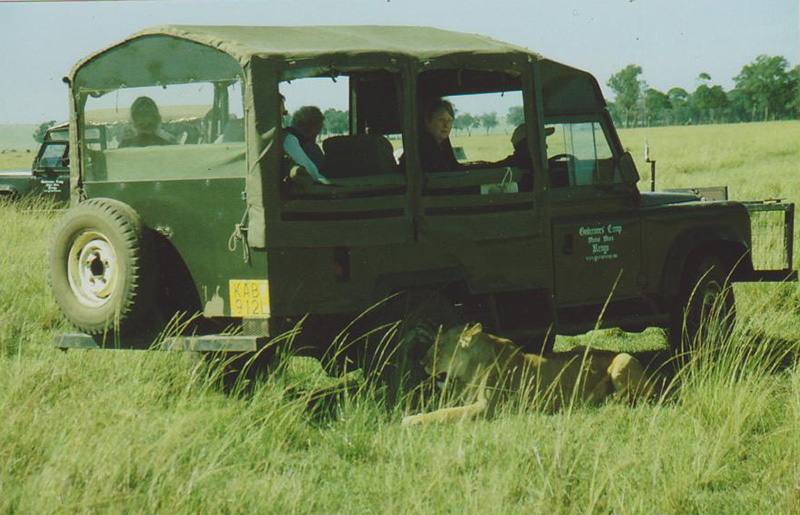 This was a safari that turned out to be different from any other in a variety of ways. For many months Kenya had experienced torrential rain, El Nino had been doing its worst. The drive from Nairobi to Namanga was relatively smooth but once off the tarmac and heading for Amboseli it was a different story. The main dirt road was treacherously muddy and in parts large areas had been washed away. 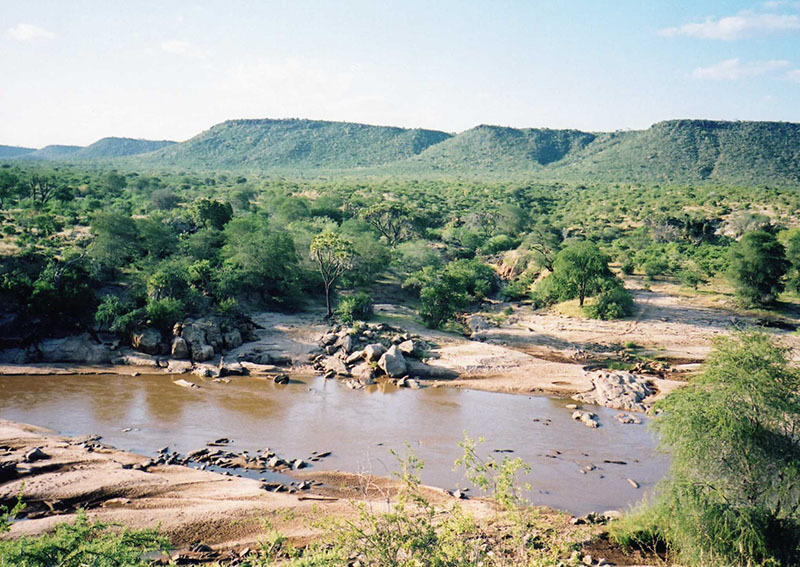 The previous day the bridge that spans the Namanga river had been flooded and impossible to cross. The debris brought down by the flood waters lay in a tangled mass of roots and branches up against the side of the bridge. The brown muddy waters swirled and tumbled over the rocks and fallen trees like a giant cauldron of boiling liquid chocolate. This year we had chosen to take a 4WD Landcruiser which was to prove our best decision............ the huge expanse of Amboseli Lake became visible, now swollen with flood water extending for miles in each direction. The natural swamp, which remains throughout the year, had extended it's boundaries and spilt out into much of the park creating a multitude of miniature lakes and causing some routes to become impassable. In the distance we could see a small group of vehicles (which turned out to be a film crew) and around them what appeared to be a group of elephants.........not one group but a long line extended back almost as far as we could see heading steadily toward the swamp........this was something very special.......we watched in silent amazement as this natural spectacle unfolded in front of our eyes............how strangely silent it was considering the number of animals we were watching. 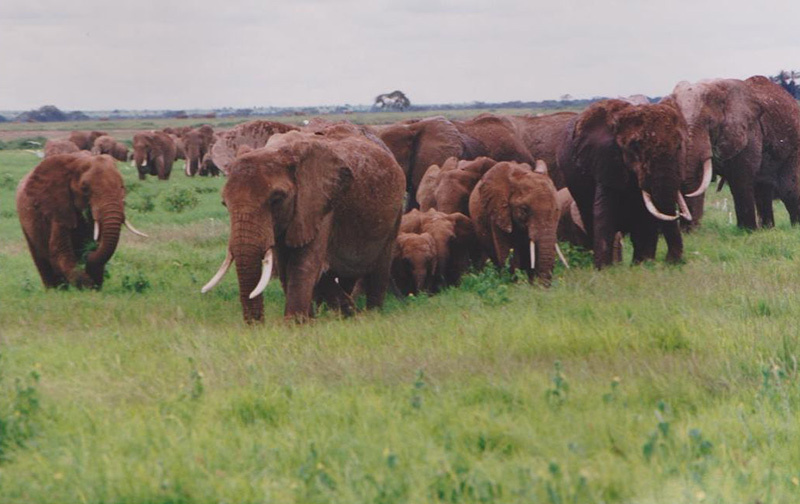 The low rumbles of conversation and occasional trumpeting seemed only to re-emphasize the silence.........upward of 150 elephants must have passed in front of us.........what a magnificent sight with Mt. Kilimanjaro, shrouded in cloud, providing a spectacular backdrop in the distance. THE ARK TO SAMBURU - extracts from "Safari, the Diary of a Wildlife Artist." 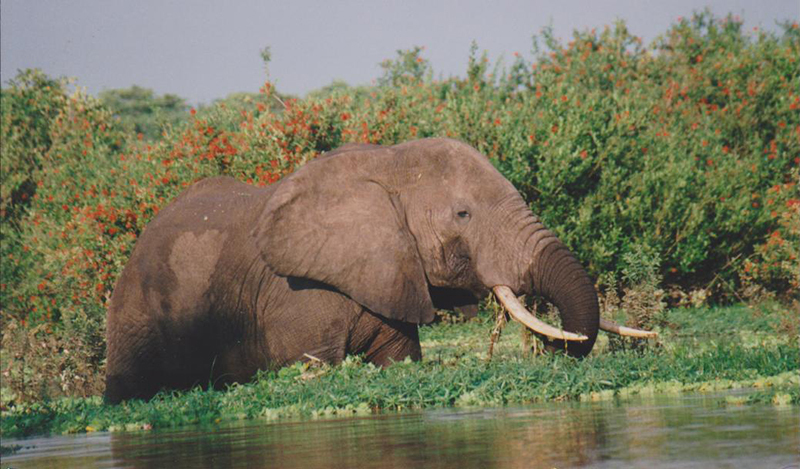 It seemed as if we had only just fallen asleep, although in actual fact at least two hours had passed by, when we were woken from our slumbers by the buzzer sounding in our ears - something exciting must be at the waterhole... I looked out of the window into the darkness outside. Below, illuminated in the floodlights the distinctive shape of a female rhino and her calf. 'Quick, quick' I urged my husband as we stumbled around the room trying to get dressed.........people were appearing from every direction, excited anticipation on their faces, clothes in disarray, camera's at the ready......... As our driver had told us ' you don't go to the Ark to sleep' however, there were no more calls and soon our stay at the Ark was over. Ruth Baker Waltons Adventures in Kenya Pausing to photograph a Buffalo Weaver bird, proved a most fortuitous stop...........driving further down the road we were suddenly stopped dead in our tracks with a squeal of brakes and clouds of dust rising up behind us. 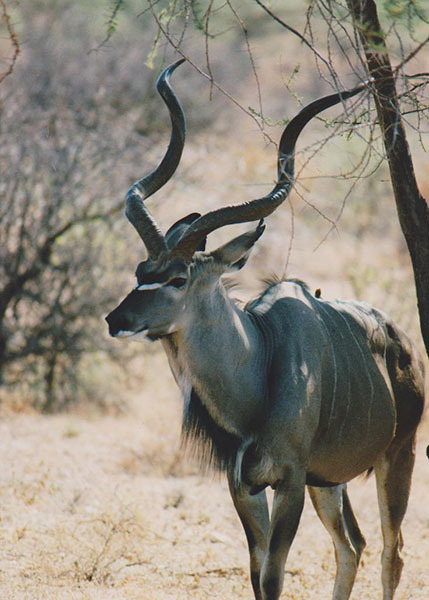 Leaping out from the bush and seeming almost to clear the bonnet of our vehicle, a magnificent male Greater Kudu followed by three females and a calf.........he was so large that he appeared to fill our windscreen as he cleared the road in a couple of bounds. Even our driver had not seen such a striking and beautiful Kudu in many years, coupled with their shy nature it was indeed a rare find.........taking a side track we head off in the direction they had gone and wait.........slowly but surely they come into view, feeding on tender leaves as they go.......soon they are in photo range and seemingly unperturbed by our presence......one hardly dares breathe let alone speak in case the spell is broken and they take flight again. FLAMINGO LAKE - extract from "Safari, the Diary of a Wildlife Artist.."
Lake Bogoria, lying some 175 miles north of Nairobi, is perhaps the least visited of the Rift Valley lakes and yet the most interesting with it's hot springs located along the western shore. Some of the geysers can erupt to a height of 16-20 ft. but those around the area we visited were slightly less impressive but hot enough to boil an egg nonetheless so it was wise to keep ones distance! It was the lack of flamingos at Nakuru that had brought us to Lake Bogoria and we were not disappointed, with groups of varying sizes along the shore line and the largest near to the hot springs being tens, if not hundreds of thousands strong..............it is the highly alkaline waters of the lake which attract the flamingos to feed on the abundant algae which grow in the warm brackish soda waters..........Unlike the other Rift Valley lakes, Bogoria had a greater wilderness feeling with the high Siracho Escarpement dominating the eastern shore........Tawny & Fish Eagles were also present in large numbers, unfortunately they are partial to flamingo. Apart from the obvious attraction of the flamingos, the other memorable experience was swimming in the hotel pool which was warmed by the waters from hot springs below and was so green in colour that you couldn't see the bottom!! !